Hi All, I have asked this question on other forums in order to capture as much feedback as possible, so apologies if you have already seen this post elsewhere. I am preparing to build a chorus gull from RCME plan by Brian Peckham Feb 02. So far I have had the plan enlarged by 25% which gives me a 6ft wingspan. I have for example noted others have commented about issues with the wing rib sizes as shown on the plan, so this is one area where I would appreciate feedback. I'll be interested to follow this as I've just completed a quarter scale Mew Gull from the Skyways Models plan-pack. I've had 6 flights so far and not one what I would call a good landing but I'm getting there. It's very good in the air and flies with authority on its 6S electric set up. How are you intending to power your Chorus Gull? Expanding the Chorus Gull to 6' ws makes it the same size as my Mew Gull so it'll be interesting to see how it build and, perhaps more importantly, flies. Prior to the test flight in late December last year. I removed the spats and they'll remain off until I master landing I've only flown it again in the past few weeks because of the weather. That looks nice Geoff. I am going to power mine with a 4 stroke ic, possibly a 90. I have just read through Michael Parry's Chorus Gull build article from February 2002 RCM&E and I can't find any adverse comments regarding the rib sizes, presumably you have this article? I do remember reading about some issues with the plan but sadly I can't remember what they were. Hopefully someone else will have a better memory than I. It's a lovely looking model and will look (and fly) even better scaled up 25%. Following with interest. I built one a few years ago now. Mainly a hanger queen as I have far to many plane's and have my regulars. hmmm we have an "OLD" plane club event coming up soon. Sad to say I cheated on the wings and had a set of foam ones made for me. There are a good few picture's here. And a build thread from another forum here. Built using the full size plan and not the freebie from the mag. I have a copy of the build article from February 2002 and the Original "Radio Modeller" article from March 1989. Can scan to PDF if required. I contacted Trevor during the construction of mine asking for advice. A nicer more helpful person you could not wish for. Hi Kevin, thank you for your response, liked your images and build blog. I have the RCM&E Feb 2002 article but not the original Radio Modeller article and so would be most grateful of a pdf. I am getting closer to doing some actual building; sum total of my efforts so far is the production of two wing rib templates. I would appreciate some advice on building the wing which has a tapered chord and section. I have magazine articles from the original design in Radio Modeller March 1989 and also the later article in RCM&E February 2002, but neither goes into any detail about wing construction. it's the tapered section element that I could do with some advice on. The ribs will be produced by the sandwich method. It appears to me the wing section should taper top and bottom from root to tip; this means I cant just build with the ribs from root to tip down on the building board as this would mean only the top of the wing would taper. What this means is ribs from the root to the tip will have to be gradually spaced off the building board, also bearing in mind building in the necessary washout. Firstly is my thinking correct? Secondly, if this is correct, is the easiest way of achieving this by including tabs on the ribs to provide the required spacing? I have included an image of the two template ribs cut and in position for drilling. Got a set of foam wings cut. Bilkits did them for me. Hey, I built the original some years ago powered by an OS 52S. Great model. I seem to remember that the published ribs were shown at the wrong size but a SAE got you the right ones. 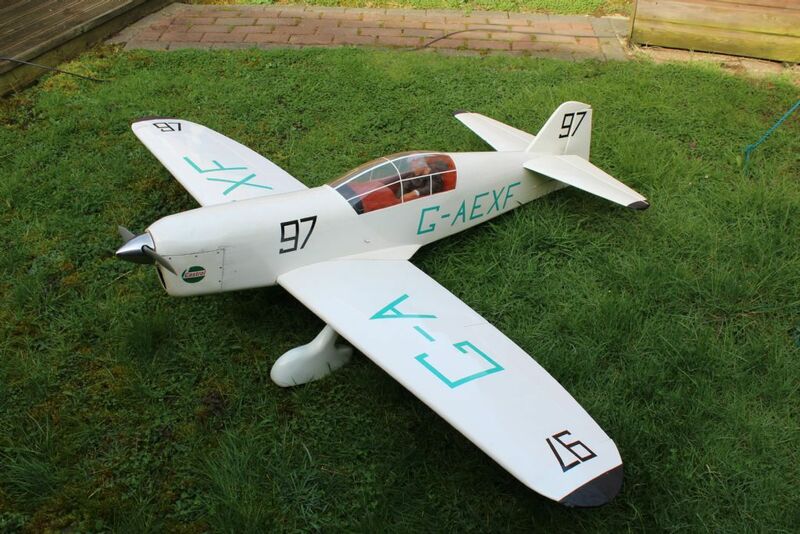 I sold this on to a club mate who is crazy on the Mew Gull because I built a 1/4 scale version powered (over powered) by a YS110 so if you bear with me I shall describe this in more detail. I easily found a free PDF by Colin Usher on t`internet of the original, but re drawn by a lady, who unfortunately does not know the difference between a rudder and a tailplane as you will see if you look at it, but otherwise quite good except that one of the formers is way too narrow; quite a job to work out the correct size given the awkward shape of them. I could not wait for a mate to print it to 1/4 scale for me so `tiled` it; 64 sheets of A4! But not all in one go. I much prefer the bubble canopy version and luckily found one from MRM at W&W. I wanted this to be more aerobatic since the smaller one would do four point rolls better than many F3A`s so I mirrored the wing top section to the bottom of it which made it fully symmetrical and of course a little thicker. The spats are a real problem so I made GF moulds for these, fixed with silicone, and halved the length of the torsion bars to stop the u/c bending back and the spats going through the bottom of the wing. The cowl is also GF. I should still have the moulds for these. If the rudder was a bit bigger it would easily do the complete 1970`s style F3A schedule. No David, I don't think it is. I don't have the plan in front of me but just pin the lower spar to your building board and glue your ribs to that, not forgetting to pack up the trailing edge, - progressively increasing spacers to the tip to create the required washout. Don't build the wing 'off the building board'. I am not a fan of foam wings but the Bill Kits foam wing cutting service looks very good value if you follow the link provided by Kevin. It might save you time and heartache if you are not comfortable building a tapered, washed-out wing. Good luck. No David, I don't think it is. I don't have the plan in front of me but just pin the lower spar to your building board and glue your ribs to that, not forgetting to pack up the trailing edge, - progressively increasing spacers to the tip to create the required washout. Thanks for your response Piers. So this would mean the wing section tapers only on the top of the wing from root to tip; the bottom of the wing will be flat. My understanding was that the root and tip ribs centres should be aligned as in the image I have posted - then you have even taper of the section top and bottom? You don`t need to worry about building in an underside taper since this will automatically appear when the wing halves are joined with a little dihedral. I do not remember bothering with wash out. The wing loading on mine is quite low and there is no tendency to tip stall. The sandwich method is not a good idea for tapered ribs, much better to download the basic Profili s/w which will produce an accurate outline of each rib. You can easily add building tabs as well and use these to provide wash out. A foam wing would be rather heavy and look quite wrong since the design calls for a partially open structure. Ok, thank you to everyone that contributed and thank you Martin, I can now see after doing a couple of basic drawings how dihedral effectively means the wing tapers top and bottom from root to tip. Martin, I see you have an image of a Mew Gull in one of your albums, is this actually the Brian Peckham Chorus Gull I am about to build? Do you have any images of the build? Hi David, I think you mean the pic of the tail end which was just put there to illustrate the rudder angle or something. This would be the 1/4 scale version and I am afraid that I do not have any pics of the build. The wing is very simple but due to not having any vertical sides the fus. really needs a jig of some sort but I do not remember using one on the 1/4 scale one.